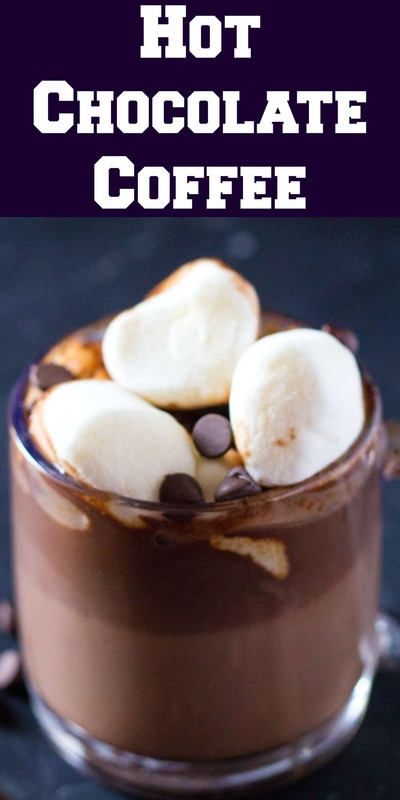 This Hot Chocolate Coffee is the perfect hot beverage for chocolate and coffee lovers. It’s thick, luscious and indulgent, and perfect for winter nights and the holidays! Picture this: It’s a cold and windy evening. Grey clouds are forming a thick blanket in the sky and the weather forecasts have been predicting a snow storm. And all you want to do is huddle in bed under your warm blankets, and spend the whole day there with a good book. That sounds like my idea of a perfect evening, but may I suggest adding this Hot Chocolate Coffee to the agenda? If spending a cozy evening, wearing thick fuzzy socks and reading a good book is your plan, I promise you, this Hot Chocolate Coffee is the perfect beverage to accompany you while you spend the evening reading away. Or maybe it’s the holidays, and before you start cooking for a big family dinner, you could do with a strong cup of coffee in the morning before all the work begins? But wait, you need something stronger than coffee, something that really warms you through, and what could be better than adding hot chocolate to the whole equation? This Hot Chocolate Coffee is perfect for this winter weather and the holiday season. Andddd wait for it…it’s completely easy to make and is ready in like 5 minutes! 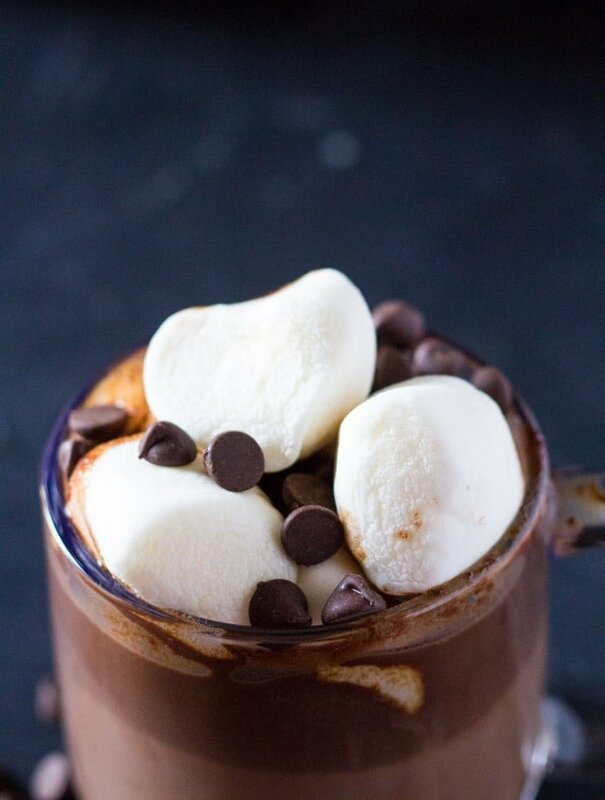 Top with marshmallows, and I can guarantee you this beverage will be put a huge smile on your face, and you will be fa la la la ling your way through whatever you have to get through whether that’s making a dinner for a large gathering, shopping for presents or just getting through a particularly cold evening! Even though this hot chocolate coffee is super easy to make, I’ve jotted down a few tips to ensure that you have the perfect hot chocolate coffee experience. 1.) To get this hot chocolate coffee lusciously thick and chocolatey, I use two kinds of chocolates: unsweetened cocoa powder and semi sweet chocolate. You can use any kind of chocolate you want: milk, semi sweet or dark. It just depends on your personal preference. Just make sure it’s a good quality chocolate. 2.) 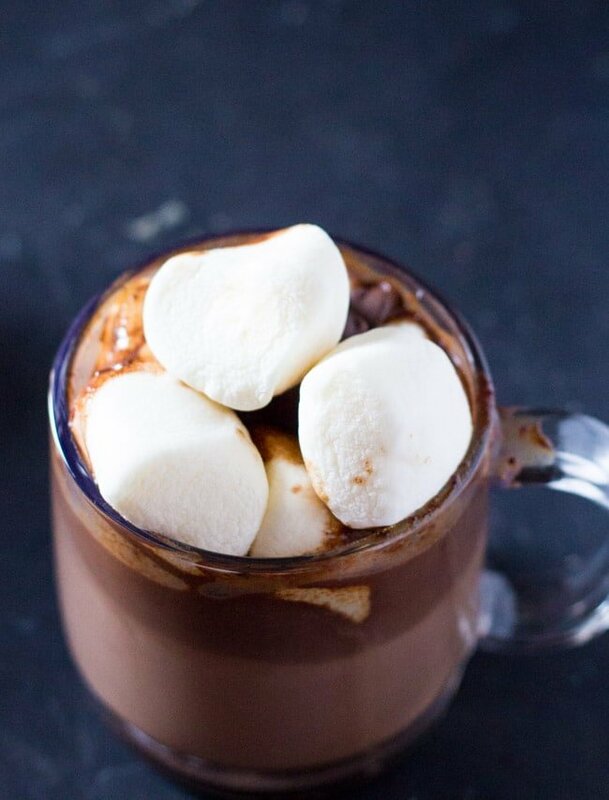 Make the hot chocolate on medium low heat, since we just want to gently melt the chocolate. So simmering the liquid is good, but do not let it come to a boil. 3.) You can use any good quality coffee. 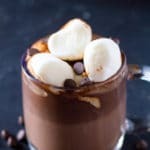 If you’re a hot chocolate lover like me here are a couple of other hot chocolate recipes you may like. 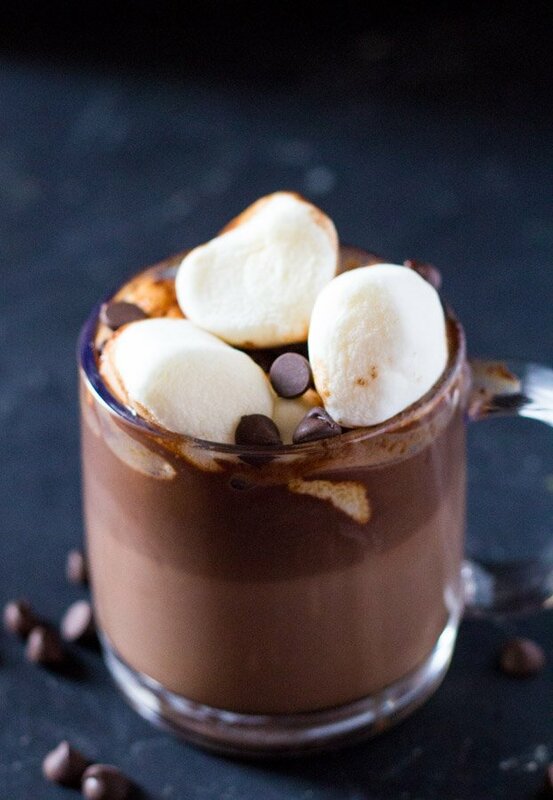 This Hot Chocolate Coffee is the perfect hot beverage for chocolate and coffee lovers. It's thick, luscious and indulgent, and perfect for winter nights and the holidays! In a medium sized saucepan, combine the milk, cocoa powder, and semi sweet chocolate, and bring to a simmer. Lightly whisk until the chocolate has completely melted. Do not let hot chocolate come to a boil. Add coffee, and whisk until combined. 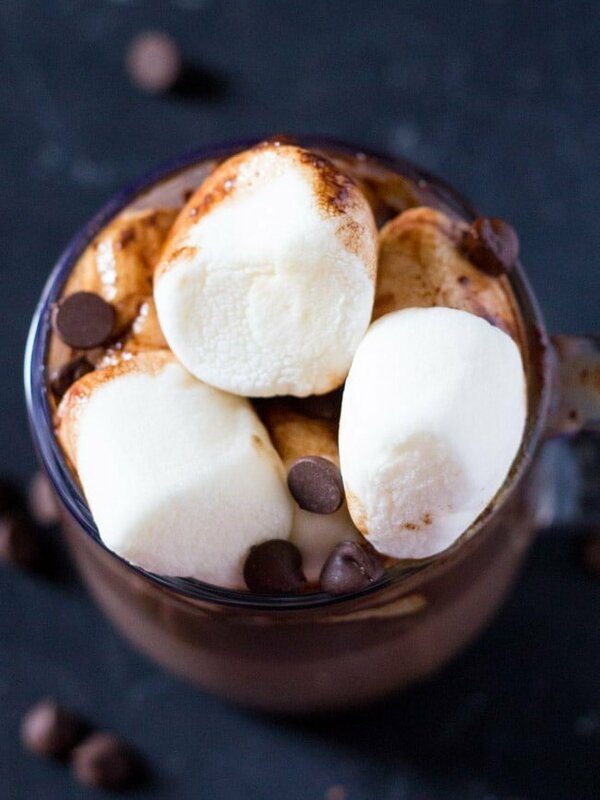 Pour into servings mugs and top with marshmallows. Oh God, what a tasty looking this Hot Chocolate Coffee is! I am in love with the colors and how simple and short the ingredient list is. Yum! I love the combination of chocolate and coffee and this hot chocolate coffee is simply heaven! I can only imagine the taste and just have to try this soon, when it’s a little colder around here! This cup looks so inviting! I love hot chocolate year round. Add coffee and I’m totally into it! You have married two of my most favourite things together into one wonderful drink! This needs to happen in my kitchen ASAP! oh wow my son will go nuts over this ! I just love hot chocolate coffee. You have described it so easily. It’ll make my day more special. Thanks a lot for your brilliant idea. Keep it up.